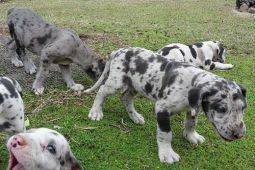 Great Dane breeders links and breed information on pups4sale.com.au. pups4sale testimonial: Wow! Thankyou pups4sale I have found excellent homes for my moodles - all sold in 4 days. I would not even bother advertising anywhere else as it's a waste of time. This is the only site I would recommend. It's so professional easy to use and the cost is outstanding. The Great Dane is one of those breeds that is easy to pick out from the bunch because of their elegant good looks and their massive height. They are one of the few breeds that could match up well with just about anyone because of their calm disposition and their playfulness. For obvious reasons, many people will assume that the Great Dane is from Denmark, but they are actually from Germany. They were originally bred to be aggressive military dogs, but have since been bred to be the calm, fun loving pooches that we all know today. Great Danes have heads the shape of a rectangle, with their noses being almost on the same plane as their eyes, which gives them their elegant look. Many Danes have cropped ears, but those that don't have ears that flop down toward their mouths.Great Danes are large dogs that have muscle from head to toe. Most of them get to be about 30 inches tall and can weigh upwards of 150 pounds. Great Danes can be found in six colors, with none of them being that much more common than the others. Those six colors are mantle, fawn, brindle, black, blue and harlequin. The Great Dane is certainly the perfect dog to call the “gentle giant” because it is a breed that simply loves to cuddle up with anyone who will allow it to. In fact, they are known for being the largest lapdogs because of the way they lean against their family member and sometimes even lay in their laps like smaller lapdogs do. Unlike other large breeds, though, they do like to get out and run around as much or more than most smaller breeds. 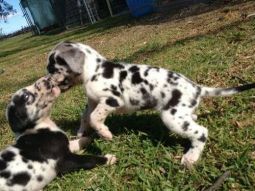 Great Dane puppies need to be taught early on in their lives to stay calm around the house or they can be destructive just by running around and running into things. They will quickly get big, so the faster that they learn not to jump up on people and to stay away from walls and end tables, the better. Great Danes are fantastic with children, but it is very important that they are never left alone together because the dog could accidentally knock kids over because of its large size. They do love kids, though, and will lay around or play with them all day and every day. While Great Danes are great with their families, they are usually more curious of other dogs than playful. However, if they grow up with other pets around the house, then they will definitely play with them and treat them as one of the family. It is best to socialize them early on in life because they can become aggressive with other animals if they even have a small feeling that they could hurt their loved ones.Because of the breed's loyalty to its family, Great Danes make excellent guard dogs and watch dogs. They will bark loudly at anything that they think could pose a threat to their humans and will attack if a stranger gets too close. Most would-be intruders would turn around before it got that far, though, because of this breed's intimidating stare and its huge size. Great Danes are one of those rare breeds that both love to be around the family and can be left alone for a little while. They aren't the type to destroy the house when left alone as long as they were trained early on in their lives. Of course, no dog should be left at home alone for too many hours. Great Danes are considered to be pretty easy to train because they enjoy spending time with their owners and they can stay focused better than many other breeds. It is a lot harder to train a Great Dane once they reach adulthood, though, so owners need to get them on a training regimen as soon as they can. To keep Great Danes from being nervous or aggressive towards other animals, they have to be socialized. This is something that many owners don't do and it can lead to problems down the road when they actually get stronger than their owners. If they learn how to act around other animals at a young age, chances are they will will be calm and playful when they reach adulthood. One training exercise that is pretty unique to the Great Dane is teaching them not to jump up on people. They can hurt someone who is not prepared for it, so teaching them to jump up only when commanded to is something that every Great Dane owner needs to do. They may not look like it, but Great Danes have plenty of energy and will exert it once they know that they are allowed to. This is definitely the biggest jogging dog on the planet, and owners will certainly turn some heads when they are running down a trail with this huge breed. 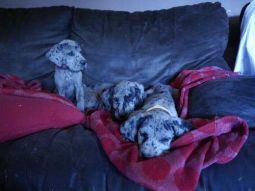 What is great about Great Danes is that while they love to run around, they naturally become couch potatoes when indoors. It is great, but it also means that owners have to stick to walking and playing schedules to keep their Great Danes in good shape. As a Great Dane gets older, owners need to make sure that they don't overwork their dogs to keep them from developing bone issues. It may end up happening regardless of what the owners do, but keeping them from overexerting themselves will prevent them from early health problems. Great Danes are not messy dogs and they have short coats, so owners will be happy to find out that their dogs need minimal grooming. They will shed a bit throughout the year, so a brushing once a week will keep their hair from going all over the house. People with smaller homes or smaller backyards will find it pretty tough to bath a Great Dane, so some choose to take their dogs to the vet for their regular baths. Bathing a Great Dane is actually easy, though, if you have the room. As with all other breeds, Great Danes need their ears checked regularly, their nails trimmed, and their teeth brushed. In total, Great Danes only require about about an hour a month of grooming to be kept in tip-top shape. 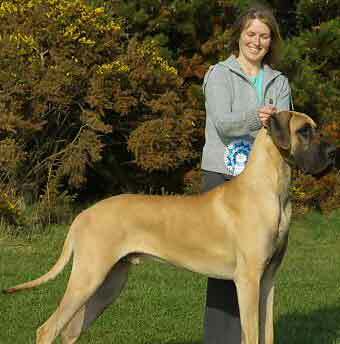 The one main downside with Great Danes is that they are prone to major health problems. Some of their most common issues are bloat, hip dysplasia and callus dermatitis, among others. While some can avoid some of the more common health problems that this breed faces, most will end up dealing with at least one of them. Bloat is the leading health concern for Great Danes and is deadly if not treated quickly. Great Danes, like many other large breeds, have stomachs that don't attach directly to their rib cages, which allows the stomach to twist if it is full and the dog runs or plays around. This is why vets advise that owners keep their Danes from doing any type of strenuous activities until 40-50 minutes after they have eaten. Unfortunately, Great Danes have a very short lifespan due to their health issues. In fact, they have one of the shortest lifespans of all of the recognized breeds. Most Great Danes won't live much longer than 7 years, but there are some that can avoid major health issues and live about 10 years. The absolute best matches for Great Danes are owners who learn how to train and live with big breeds. This is a big breed with a ton of energy, so owners who have experience with Great Danes or are willing to learn how to handle them have a much higher chance of raising a good all-around dog. 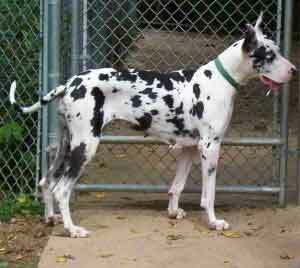 It is unfortunate that Great Danes are prone to such terrible health problems, but it is even more terrible that many of these dogs never get adopted because of those potential health problems. People who want to have great dogs and understand that those issues will probably happen within 8 years should definitely look into getting this breed. People with small apartments usually aren't the best fits for this breed only because Great Danes do like to get up periodically and stretch their legs. They won't necessarily get claustrophobic, but they may choose to simply stop getting up if they don't have enough room to roam around. People who just don't have the time to train their Great Danes will end up with more problems than they can imagine, which is why anyone who doesn't want to learn how to train their dogs or they just don't have the time should look into getting another breed. This breed will end up jumping on people out of excitement if not trained correctly, which could lead to injuries. By nature, the Great Dane has just about everything that owners look for in a dog. They are as loyal as dogs come, are easily trainable, and they love to be outside and play around with their families.